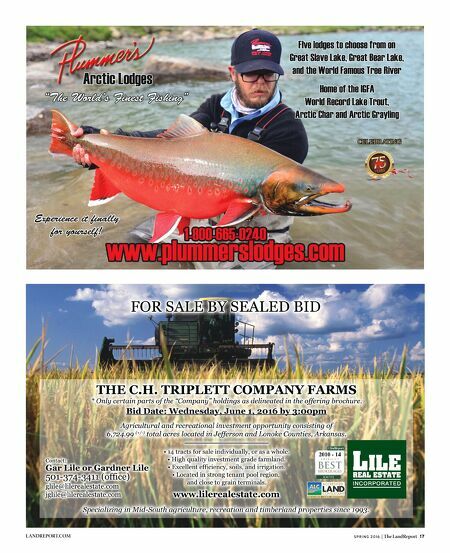 16 The LandReport | S P R I N G 2 0 1 6 A National Roundup of Rural Real Estate News COMPILED BY STEPHEN O'KEEFE, CFA LANDREPORT.COM G REAT LAKES $17.3M Easement to Protect 67,347 Acres in Wisconsin The state's DNR has extin- guished development rights on 100 square miles of forestland straddling the Mississippi and Great Lakes watersheds. GREAT PLAINS Waurika Farms Sells at Auction for $11M Hall & Hall Auctions sold the Drummond family's Oklahoma cattle opera- tion for $1,833 per acre, well above pre-sale estimates. SOUTH American Forest Management Buys International Forestry Consultants AFM currently manages 4.5M acres of privately owned timberland. The ac- quisition launches it into the Pacific Northwest. W EST Sporting Ranch Capital Management Debuts Jay Ellis will topline the Dallas-based private equity fund, which focuses on undervalued ranch properties across the Rocky Mountain West. SOUTHWEST Arizona Governor Vetoes Legislation Seeking Federal Lands The bill demanded Uncle Sam turn over title to 48,000 square miles of public lands. Jan Brewer respectfully declined. MIDWEST Farmland Values Continue to Climb in Seventh District The Chicago Fed reports that farmland values in this key agricultural belt continued their climb in 1Q. Complete details on pages 24-25. PACIFIC George Lucas Shelves Movie Studio Plans for Grady Ranch Despite great effort, the Marin County landowner failed to sway opponents of his studio. He saw more jobs. They saw more traffic. Everyone loses. N ORTHEAST Nantucket's Swain's Neck on Market for $59M The 1997 sale of the 68-acre estate to Russell Phelon set a New England record. Gary Winn at Maury People Sotheby's has the listing. 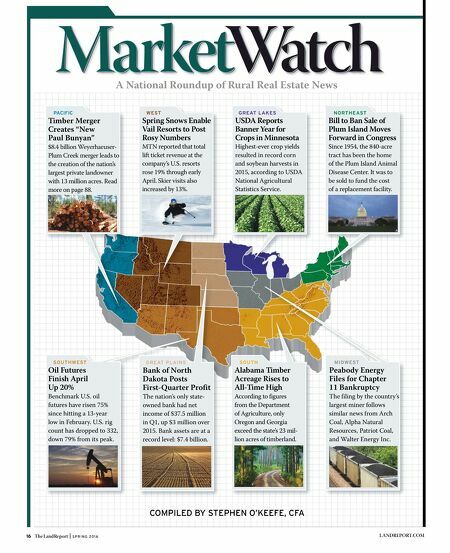 A National Roundup of Rural Real Estate News COMPILED BY STEPHEN O'KEEFE, CFA GREAT LAKES USDA Reports Banner Year for Crops in Minnesota Highest-ever crop yields r esulted in record corn and soybean harvests in 2015, according to USDA National Agricultural Statistics Service. GREAT PLAINS Bank of North Dakota Posts First-Quarter Profit The nation's only state- owned bank had net income of $37.5 million in Q1, up $3 million over 2015. Bank assets are at a record level: $7.4 billion. SOUTH Alabama Timber Acreage Rises to All-Time High According to figures from the Department of Agriculture, only Oregon and Georgia exceed the state's 23 mil- lion acres of timberland. WEST Spring Snows Enable Vail Resorts to Post Rosy Numbers MTN reported that total l ift ticket revenue at the company's U.S. resorts rose 19% through early April. Skier visits also increased by 13%. SOUTHWEST Oil Futures Finish April Up 20% Benchmark U.S. oil futures have risen 75% since hitting a 13-year low in February. U.S. rig count has dropped to 332, down 79% from its peak. MIDWEST Peabody Energy Files for Chapter 11 Bankruptcy The filing by the country's largest miner follows similar news from Arch Coal, Alpha Natural Resources, Patriot Coal, and Walter Energy Inc. PACIFIC Timber Merger Creates "New Paul Bunyan" $8.4 billion Weyerhaeuser- Plum Creek merger leads to the creation of the nation's largest private landowner with 13 million acres. Read more on page 88. NORTHEAST Bill to Ban Sale of Plum Island Moves Forward in Congress Since 1954, the 840-acre t ract has been the home of the Plum Island Animal Disease Center. It was to be sold to fund the cost of a replacement facility.